The cobbler is an American classic in which fruit is topped with spoonfuls of biscuit dough and then baked, creating a cobblestone effect. Blueberries are often the fruit of choice for this pie-like dessert, but we've added sweet slices of nectarines for a fresh and tasty twist on the classic blueberry cobbler recipe. 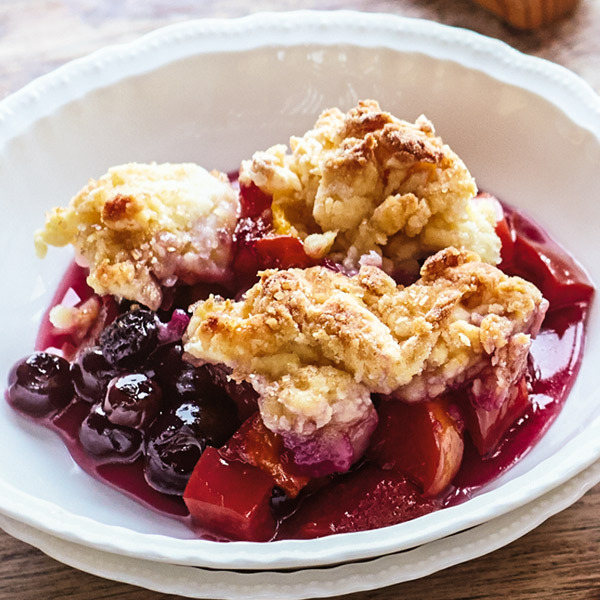 Served warm and topped with vanilla ice cream, this delightful Blueberry-Nectarine Cobbler is the perfect way to end any summer meal. Preheat oven to 375°F. In a bowl, mix blueberries, nectarines and sugar to combine. Pour fruit evenly in the bottom of a 13-by-9-inch greased baking pan. In a large bowl, whisk together the flour, baking powder and salt. Using your hands, rub the butter into the flour mixture, squeezing and pinching with your fingertips until the mixture resembles a coarse meal and there are no butter lumps bigger than a pea. Add the sugar and whisk to incorporate. Pour ½ cup half-and-half into a small bowl or measuring cup and add the egg. Beat with a fork to mix well. Pour the wet ingredients into the flour mixture, and then stir gently to just combine. Drop dough by spoonfuls over the fruit mixture. Sprinkle with turbinado sugar. Bake for 55 minutes or until golden brown.